The hostel experience that you expect!!! SUPER ... Saman Hostel esta muy bien ubicado, es un sector super agradable. La atencion es excelente. Y toda la informacion que requieras saber para ubicarte y aprovechar tu tiempo, alli te la proporcionan. El trato es super agradable y muy buen ambiente! 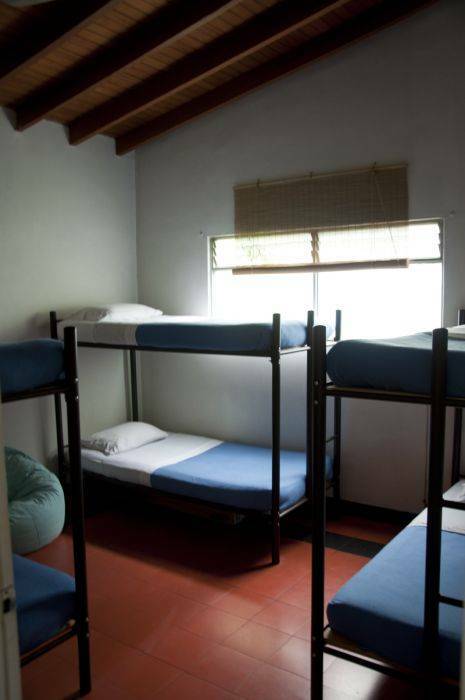 We offer lodging in shared rooms with bunk beds as well as in comfortable rooms with double beds. These include all the linen and towels. Our 3 bathrooms have hot water and great showers 24/7. 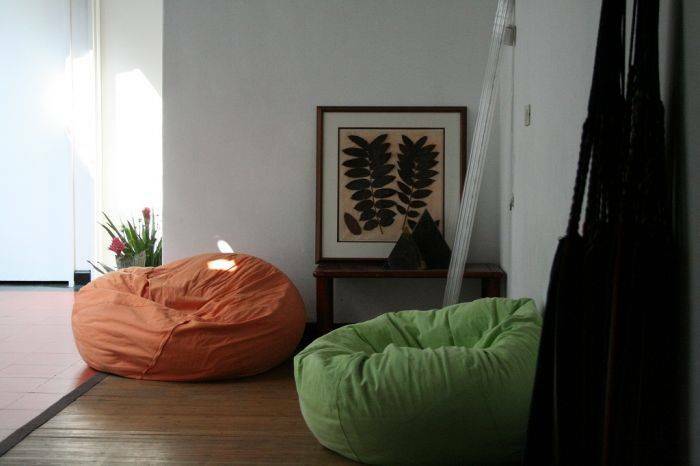 We guarantee a clean and a peaceful atmosphere to our visitors. Besides, our guests have wireless access to Internet in every room. there is also a very nice living room with a big tv and a dvd, and a courtyard with hammocks. For smokers, Samán has a balcony. We have free coffee all day long, a fully equipt open kitchen and laundry service for a low fee. Finally, our desire is to help our guests to enjoy the beauty of Medellin and Colombia, we give them a friendly service, including useful information to enjoy their stay in Medellin. Our check in at 2 pm and our check out is until 12 noon. We can hold your luggage until your departure time if it is after our check out. We have 24 hours reception service. We only take cash in colombian pesos. 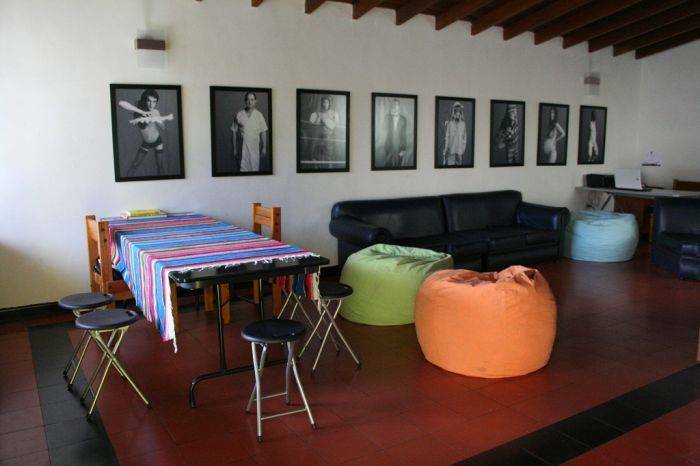 Saman Hostel is located in El Poblado, which is Medellin's hot spot for business, entertainment, shopping, and leisure activities. 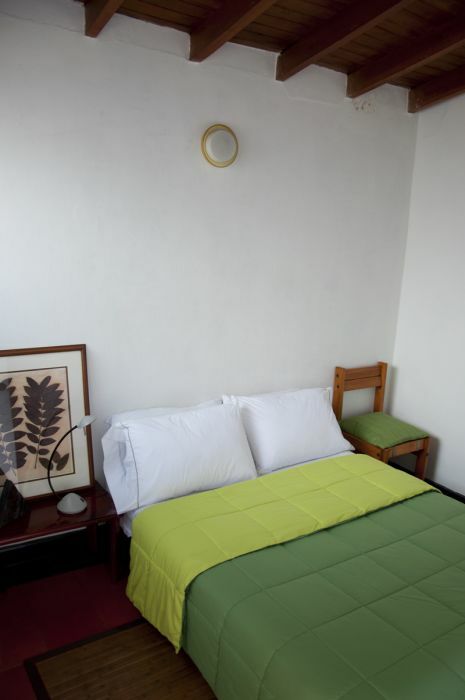 Particularly, Saman Hostel is two blocks away from "El Parque Lleras", where you can find a number of options for dining, drinking, dancing, go shopping, or just sit down and enjoy a Juan Valdez’s cup of coffee. 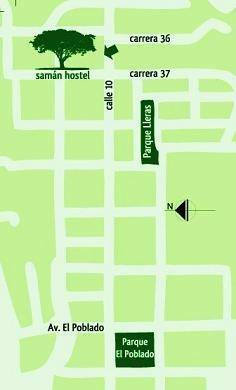 Samán Hostel is at famous bolulevard “Calle 10” crossing with the career 36. You will find this corner easily because there is a Domino”s Pizza on the right hand side. If you arrive at the North terminal, you can take the metro ($1. 400 COP ticket US$0, 70) from the Caribe station and go to the El Poblado station. Take either a cab or a bus to get to Saman Hostel. If you take a bus, make sure it goes to any of the following destinations: “El Tesoro”, “Viscaya”, “La 10”.